Grab your friends and head on over to the pool for a dance party that will have your heart pumping, muscles toning, and body grooving! 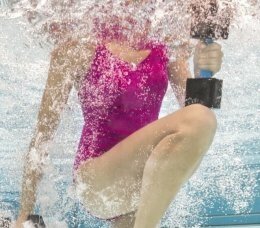 Aqua Zumba is a high energy, low impact water fitness activity that feels far more like a water dance party then an actual workout. The natural buoyancy of the water supports your body and allows you to move and groove with ease, no matter your age or fitness level. Water resistance helps you tone and shape your muscles while getting a true workout! New to Aqua Zumba? No worries, all you need is a chlorine resistant swimsuit and a pair of water shoes.